A geothermal heating and cooling system uses the constant temperature of soil or water located below your home to heat and cool it. Also called geothermal heat pumps, GeoExchange, earth-coupled, ground-source, or water-source heat pumps, geothermal has been in use since the late 1940s. It uses the constant temperature of the earth as the exchange medium, opposed to other systems that use outside air temperature. This allows the system to reach fairly high efficiencies (300 to 400 percent) even on the coldest winter nights. The key benefit of ground source heat pumps is they concentrate naturally existing heat, rather than by producing heat through the combustion of fossil fuels. The technology relies on the fact that the earth (beneath the ground surface) remains at a relatively constant temperature throughout the year, warmer than the air above it during the winter and cooler in the summer, very much like a cave. A geothermal system takes advantage of this by transferring heat stored in the earth or in ground water into a building during the winter, and transferring it out of the building and back into the ground during the summer. The ground, in other words, acts as a heat source in winter and a heat sink in summer. The system includes three principal components. Using the earth as a heat source/sink, a series of connected pipes, commonly called a “ground loop,” is buried in the ground near or around the building to be conditioned. The loop is buried either vertically or horizontally. It circulates a refrigerant that absorbs heat from or relinquishes heat to, the surrounding soil, depending on system operation. For heating, a geothermal heat pump removes the heat from the refrigerant in the earth connection, concentrates it, and then transfers it to the building. For cooling, the process is reversed. Conventional ductwork is generally used to distribute heated or cooled air from the geothermal heat pump throughout the building. For hydronic heating and cooling systems, radiant panels and respective tubing are used as the heat exchanger. Although many parts of the country experience seasonal temperature extremes — from scorching heat in the summer to sub-zero cold in the winter—just a few feet below the earth’s surface, the ground remains at a relatively constant temperature. Depending on latitude, ground temperatures range from 45°F (7°C) to 75°F (21°C). Much like a cave, this ground temperature is warmer than the air above it during the winter and cooler than the air in the summer. A direct exchange geothermal system takes advantage of this by exchanging heat with the earth through a ground heat exchanger. As with any heat pump, geothermal can heat, cool, and, if equipped, supply the house with domestic hot water. Compared to air-source heat pumps, the geothermal system is quieter, lasts longer, needs little maintenance, and does not depend on the temperature of the outside air. Even though the initial cost of a geothermal system can be several times that of an air-source system of the same heating and cooling capacity, the additional costs are returned to you in energy savings in 2 to 5 years. System life is estimated at 25 years for the inside components and more than 50 years for the ground loop. We designed a simple, four-step process to get an EarthLinked Renewable Energy System for your property. 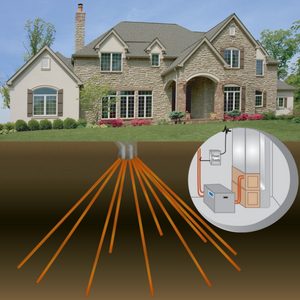 Your geothermal system is built specifically for your home, taking into consideration your space limitations, geography, and energy-saving goals. EarthLinked Renewable Energy Systems are only installed by an Authorized Dealers. In order to stay authorized, dealers pass extensive and on-going training. Unlike most geothermal technologies, EarthLinked’s Renewable Energy Systems allow for a non-disruptive installation process. Smaller equipment and minimal yard space allow for minimum customer delays. For your protection, we provide warranties on our products and contractor support in the field. Should you require service, as an Authorized Dealers, we are available to evaluate your needs and serve you quickly and efficiently.